According to the Census, as reported in the WSJ, the Hispanic population grew by over 15 million from 2000 to 2010: from 35.3 to 50.5 million. That's 43% in ten years. The Mexican-American population alone grew by 11 million. 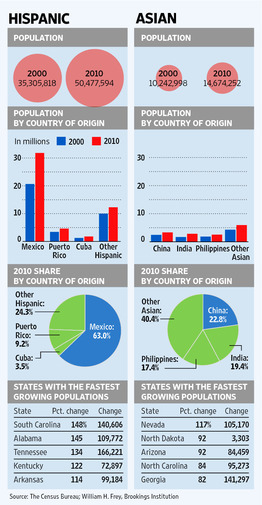 How much is the Hispanic population going to go up in this decade? 20 million? 25 million? According to the conventional media wisdom, this growth in population is hugely relevant to elections, but were utterly irrelevant to the house price bubble in the middle of the last decade or to increases in carbon emissions.